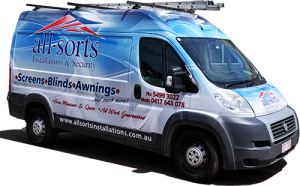 ALL SORTS INSTALLATIONS & SECURITY HAVE SERVICED: BRISBANE, SUNSHINE COAST AND THE SOUTH EAST QLD FOR OVER 18 YEARS. WITH OUR EXPERIENCE AND KNOWLEDGE IN THE HOME INDUSTRY, OUR ATTENTION TO DETAIL WILL HELP YOU FINISH YOUR PROJECT WITH EASE. WITH A FULLY EQUIPPED FACTORY WE ARE ABLE TO HANDLE THE BIG OR SMALL JOB, WE CAN ALLOW FOR QUICK TURNAROUND AND GUARANTEED BEST PRICES. All of our products are manufactured locally in our fully equipped factory to allow for a quick turnaround and guaranteed best prices! Feel free to drop us a line or get a free measure and quote today!